Viscosity Philosophy – BG Products, Inc.
There’s a common misconception that crankcase oil and gear oil share the same numerical nomenclature (i.e. 20W-50 and 75W-90). What’s worse, standard OEM manuals further the confusion by specifying grades of crankcase oils for gear oil applications. The information gap is an industry-wide problem. However, knowing how to use a viscosity classification chart, can keep you from getting lost in translation. What does a chemist have to say? “With BG Products being a company that desires teaching high quality and performance, we want to provide the best product available for each application. Although the OEM might recommend crankcase oil for a gear application, we know there are chemistries that provide much better protection and performance,” says Dustin. “With this in mind, we can often provide better wear protection, better corrosion control, and better performance for the system components.” To achieve these results, the BG consultant must do a little ‘oil translating.’ Brushing up on your viscosity-language skills will make it easier for you and the customer. Let’s start with a quick definition of the word viscosity. Viscosity is defined as a measure of a fluid’s ‘thickness’ or resistance to flow. For example, water is ‘thin,’ and has a low viscosity, and maple syrup is ‘thick,’ or has a high viscosity. But because viscosities of oils vary with temperature, the absolute viscosity must be measured at specific temperatures. Cross with a 75W-90 gear oil? A chart created by the SAE called Viscosity Classification Equivalents displays the details of these oils and when read horizontally, can be compared against each other. Kinematic viscosity is the resistance of a fluid to flow under the influence of gravity. The fluids are measured at two fixed temperatures. The red column on the left displays various grades of crankcase oils by weight (i.e. 50, 30, 10W) while the column on the right displays grades of gear oils by weight (i.e. 140, 90, 75W). 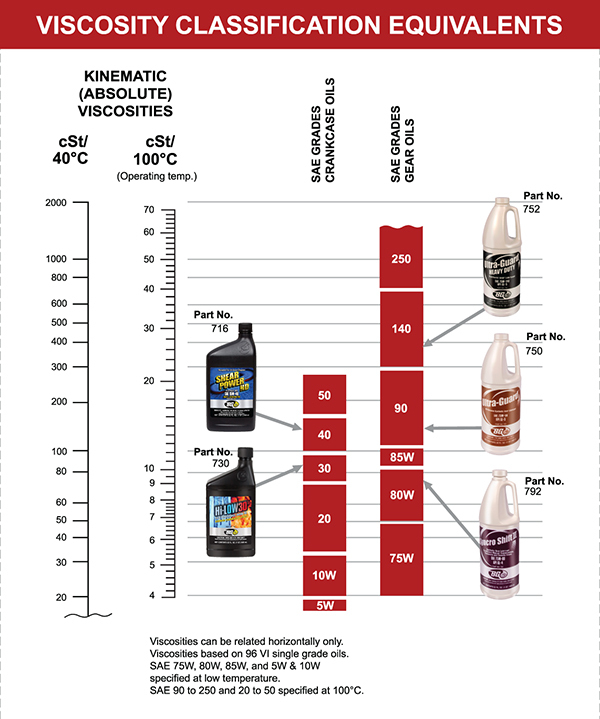 To compare viscosities across the chart, R&D lab technicians follow a process called “read-across.” By reading across the chart, we see that at operating temperature, a viscosity of 18 cSt can describe 50-weight crankcase oil and 90-weight gear oil. The common misconception is that a 90-weight gear oil is thicker than a 50-weight engine oil simply because the number 90 is higher than the number 50. Actually, they share much of the same viscosity range, but the nomenclature, or naming system, is different. Now, let’s look more closely at an Allison Transmission Service Information Letter that recommends SAE 30 for a manual transmission. Simple logic would tell you this recommendation is referring to gear oil because it’s going into a manual transmission. However, there’s no such thing as 30-weight gear oil. Hence, we’d assume the OEM is recommending crankcase oil for a gear application. If we do the read-across from there, we’ll find that the recommendation of SAE 30 also translates to 80-weight gear oil. But according to Mike Belluomo, BG Technical Services Manager, finding the best fluid for the transmission also includes finding the right formulation, specified application and desired performance. In terms of SAE grades, we simply have two different categories of names assigned to two different lubricating oils. But because oils are known by their grades, their properties are easily misconstrued. Furthermore, some OEMs recommend a variety of dissimilar oils for the same application (i.e. crankcase oil in a gear system). BG does not advocate this liberal use of dissimilar oils. 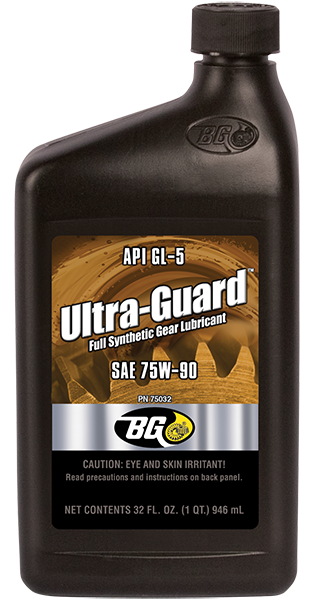 In order to be best protected, each application requires matching the right oil with the right additives. So, how do we know which is the right oil? By measuring the viscosities and specific performance design, of course! Use your chart as a guide and you’ll be speaking the crankcase and gear oil languages, fluid-ly.